Leave it to LinkedIn to find a way to add even more spam to your life. The professional social network has a new app called Elevate that aims to turn the world's corporate drones into content sharing machines. 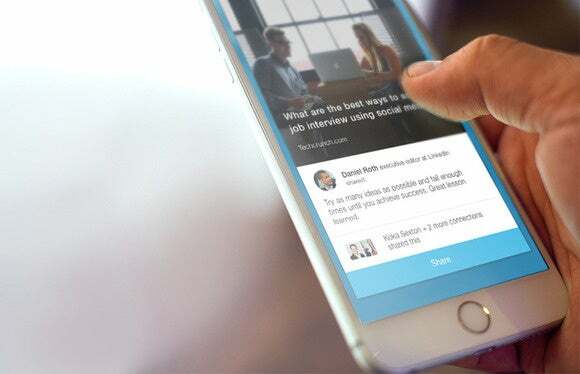 With this new app, companies can offer employees a steady stream of content such as articles and bland quotes they can share online. LinkedIn apparently got the idea for Elevate after it noticed that about 2 percent of employees re-share content that their companies have shared on LinkedIn—but that that small sliver of cogs in the machine are responsible for around 20 percent of an average company's LinkedIn engagement, such as clicks, likes, comments, and shares. LinkedIn argues that all that engagement goes beyond just upping a shared article's like count. LinkedIn says when someone shares six pieces of content on LinkedIn they average six new profile views and make two new connections. People also check out the company the employee works for, and on average the company gets six job views, three company page views, and one new company page follower. All of that engagement, LinkedIn argues, can be converted into better hires, improved marketing, leads, and sales. The impact on you at work: If you're a worker bee for a medium-sized or large enterprise with a penchant for social media engagement, watch out. This summer you may have social media share quotas right along with your sales and lead generation targets. At the very least, you may be highly encouraged to start sharing more content online with LinkedIn's new app. Elevate's content stream is a combination of recommendations from LinkedIn Pulse and Newsle, as well as human curation. Content can be shared on LinkedIn and Twitter for now. The app also lets you schedule sharing times to ensure any shared content hits the social networks when your followers are most likely to see it. Once all the sharing is done, Elevate offers analytics accessible to both the employee and the higher-ups. The analytics show how many likes, comments, and re-shares a given piece of shared content got, as well as how many people it reached. It will also provide more fine grain data like job views, new company followers, as well as how sharing resulted in new hires, leads, and sales. Elevate is an attempt to quantify social media activity with hard numbers and the results they generate, which can help LinkedIn justify its usefulness to professionals and companies. LinkedIn's new app is only available by invitation right now, but Elevate will hit general availability this summer with apps for Android, iOS, and the desktop. Elevate will be a paid feature, according to TechCrunch.